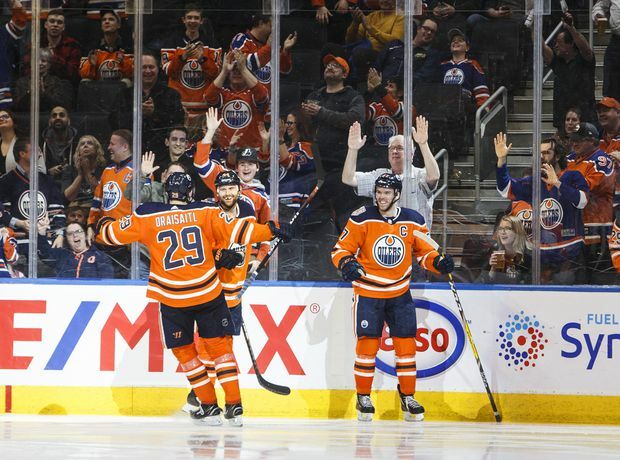 Edmonton Oilers' Leon Draisaitl, Zack Kassian and Connor McDavid celebrate a goal against the Columbus Blue Jackets during a game on March 21, 2019. Faint hope remains for the Edmonton Oilers’ playoff hopes. “We’re not stopping pushing, regardless of how it looks when you look at the standings, we’re going to keep pushing, we’re going to keep picking up points and see what happens,” said forward Ryan Nugent-Hopkins, who had one of the Oilers’ goals. “We’re trying to climb back in it and we just have to take it game by game and try to collect as many points as we can on this homestand and the rest of the games and see where we stand,” said Draisaitl. Columbus’s loss coupled with Montreal’s 4-0 shutout of the New York Islanders earlier in the day put the Canadiens into the Eastern Conference’s second wild card spot, one point ahead of the Blue Jackets. Oilers CEO Bob Nicholson took some heat after comments he made at a season ticket holder’s breakfast earlier Thursday. Nicholson seemed to blame forward Tobias Rieder’s lack of production as a major factor in Edmonton’s record, adding he would not be re-signed. Edmonton made it 3-1 when a McDavid shot went off the post and then bounced off of Korpisalo’s back and in for his 37th of the season, putting him one point back of tying his career season high point total of 108.